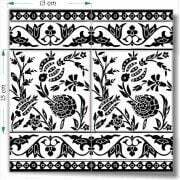 Made with a combination of hand screening and hand painting these unique black & White Tile designs add a subdued decorative element to any bathroom or kitchen tile design project. Combine these B&W decorative tiles together or with matching tile borders for a fantastic effect. Since 1922 the Balian Tile Studio of Jerusalem has been producing decorative ceramic tiles of the highest quality and beauty. Our tiles are fired to about 1000 Centigrade so as to give maximum durability to the hand painted or silk screened tile designs which you see above. Use them also as residential floor tiles in your bathroom or kitchen tile design projects. Will withstand all interior or exterior installation. For frost resistance we recommend ordering these decorative tile patterns on our porcelain tiles.